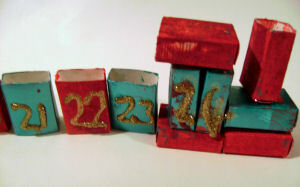 Here is an unusual advent calendar! The kids will enjoy making this advent train ... and they'll have even more fun finding the gifts inside the train during December! Carefully cut / rip off the top and flaps from 24 of the boxes. Paint 12 red and 12 green. Paint 3 of the complete boxes red and 3 green. We mixed some glitter in with the paint for added sparkle. Leave them to dry. To make the train, glue two of the red boxes together along the smallest side (the tops) to form the base of the train. Glue two of the green boxes together along the biggest side to make the cab, glue these to the base and add the last red box as a roof. Glue the last green box onto the base at the front. Finally add one of the open red boxes as a funnel. Use glitter glue to write numbers on each of the open boxes (carriages). Write 24 on the side of the train. Take a long needle and gold thread. Start with box one and thread the needle through all of the boxes to number 23, secure the end to box 1 with a piece of sticky tape and to the train with another piece of tape. Stand a chocolate Santa or snowman or other Christmas treat in each of the carriages and in the train funnel!